Posted on February 13, 2011 . 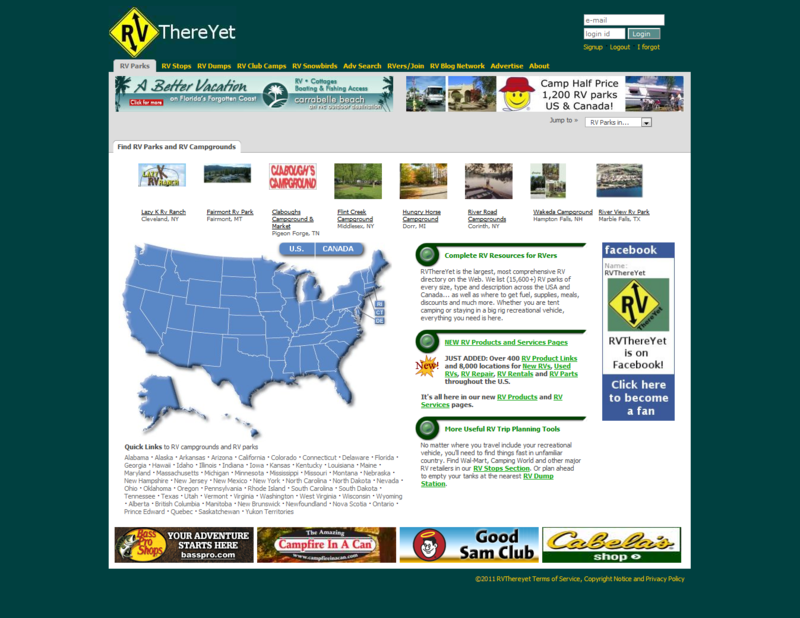 RVThereYet was designed from scratch to fill a need in the RVing community. There are over 16,000 RV parks in the US and while they are adequately represented in big phone book size directories there was a need to represent them online. What started as a directory for only the Northwest has grown to all of the USA, Canada, and parts of Mexico. The design needed to attract all types of Rvers with all types of RVs, so the design doesn’t showcase expensive RVs at risk of losing users who couldn’t afford luxury RVS. Neither are their pictures of any age group, so that any one group wouldn’t feel that this site “wasn’t for them”. Rather, what is featured are the RV parks and the information needed to make an educated decision on what park to stay in. RV park listings have basic location information and detailed amenity information as well as reviews and photos. Besides filtering searches by city and state their is a detailed advanced search option. Featured parks are displayed prominently throughout the site and at the top of every search result.